FCSB will take on Dinamo Bucharest in the second round of the Romanian Liga 1, a match which is not quite the huge derby it once was before FCSB lost its Steaua Bucharest identity. Nevertheless, it is still a derby, with many fans still being very passionate about this rivalry. FCSB is yet again the title favorite this season, although they failed to win a trophy since 2015. This also looks like the weakest squad FCSB had in some time, as they lost a couple of key players and didn`t bring any proper replacements. As such, it wasn`t quite a big surprise that the team played very poorly and lost in the first round 0-1 against Astra. FCSB bounced back on Thursday with a 2-0 road win in Europa League, but the opponent (Rudar Velenje) was below average to say the least. 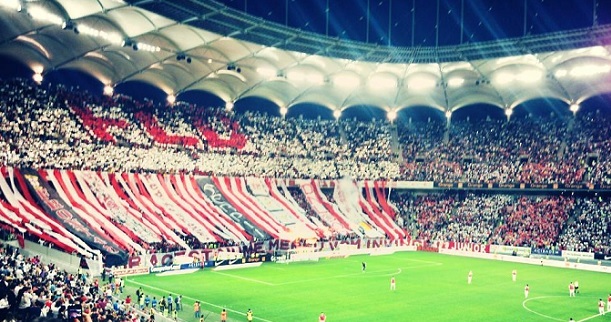 Dinamo Bucharest will attempt to reach the playoffs this season after missing out last year, and maybe even make a push for the title. The Red Dogs didn`t make notable transfers in the Summer, but on the bright side they didn`t lost key players either, and they have a cohesive squad with a few top class players surrounded by promising youngsters. Dinamo didn`t play well in the first round last week, but still managed to claim a 2-1 home win against Voluntari. Bet on FCSB v Dinamo Buc and claim your 100% (100 Eur) freebet at Ohmbet now! FCSB will miss key midfielder Pintilii, arguably the most important man in the team. Dinamo Buc will be without attacking midfielder Pesic, a solid rotation piece who is in conflict with the manager. FCSB is a 1.75 – 1.80 odds favorite here, and they have been the favorites in each match against rivals Dinamo for quite a few years now. However, that has rarely translated onto the pitch. FCSB has won only two of the last 14 meetings against Dinamo (each time by 1 goal). The Red Dogs won 5 times, and there have been 7 draws. Dinamo`s success against their rivals might have something to do with their fans always creating a crazy atmosphere in these games, or with the simple fact that their usual approach against FCSB (a counterattacking style) suits them perfectly. At the same time, FCSB traditionally has problems against counterattacking teams. There really isn`t much reason to expect FCSB to have better success against Dinamo this time around. This FCSB team is weaker than in last seasons, they haven`t looked good in the first two matches, and a fair question can be asked if they even have much superior quality over Dinamo. In the previous seasons FCSB had much more individual quality than the Red Dogs – they still do, but only just. The bookies are giving FCSB huge credit ahead of this clah, but it looks closer to 50-50 match than what the bookmakers suggest. Some goals could also be expected, given that 10 of the previous 11 meetings saw both teams scoring, and 7 of the last 9 saw over 2.5 goals being scored. Dinamo really has a poor defense which is unlikely to keep a clean sheet against anybody, but the Red Dogs do have quality from the midfield up, and they are sure to create good chances in every match. However, my tip here will be Dinamo to cover the +1 asian handicap. The odds are lower than for both teams to score, but it does look like a safer bet. FCSB hasn`t beaten Dinamo by more than 1 goal since 15 matches ago and chances are that trend won`t be broken tonight. It must also be noted that FCSB is the home team only on paper. The game will be played at the National Stadium, where FCSB plays all its home games, but where Dinamo also plays as a home team from time to time. The fans will be split in numbers, with Dinamo sure to have the more vocal supporters. Prediction: FCSB – Dinamo Bucharest 1-1.